Archer Thomson, Crowley, Jones . . .
A pioneer climber with an appreciation of bouldering . . .
James Merriman Archer Thomson (1863-1913) : G. W. Young's comments about the Eckenstein Boulder in Snowdon Biography actually end with a reference to the practice of the sort of balance work promoted by Eckenstein by one of the truly great pioneers of Welsh rock climbing : "Archer Thomson practiced with him [on the boulders] , trim and dark-clothed, with lion eyes and mane, and supple, silent movements. He became by a short head the first practising master of this conscious skill". Professor Orton, in Thomson's obituary in the 1913 CCJ, makes the somewhat cryptic statement: "He has often acknowledged to the writer of these lines the debt he owed in particular to one instructor [at Pen-Y-Gwryd]". This could only have been Eckenstein, who was frequently on the sharp end of establishment climbers' invective. 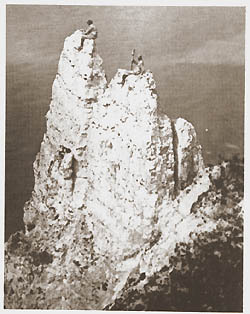 Through practice on boulders, as well as lead climbing, Young continues: "He evolved the somewhat specialized type of climbing which has been principally responsible for the extraordinary advance made in the standard of difficulty in recent years; the slow controlled movement, depending on a fine balance rather than a grip, and identical in pace and security upon easy crags or on the hardest passages." "poised on nailholds high upon a steep slab, he would lean right back from his waist, mutely meditating upon the difficulties above for minutes together. . . leaning easily outwards, with half his body free, his feet and knees attached to the rock on some principle of balance all his own, and gazing upward with a smiling intentness that seemed half critical examination and half remote and contemplative pleasure." (G. W. Young). Eckenstein & Archer-Thomson at Lliwedd - by A. W. Andrews, circa 1903 Thomson went directly to Wales from Cambridge in 1884. In 1896 he was appointed Head Master of Llandudno County School, a post he held until his death in 1913. At college he was Captain of the Football Club, and was on the lawn tennis squad. He was the best ice skater in North Wales, and once, when skating on a Sunday, incited the wrath of several quarrymen who considered his act a sacrilege. They actually began stoning him, but then dropped their stones and applauded Thomson, fascinated by his skill. He was reticent, and known to many of his comrades as a reclusive poet, rarely speaking but enjoying their companionship, nevertheless. Young comments: "For a number of us the cliffs of Snowdon . . . and the incomparable precipices of Lliwedd . . . will be haunted, and almost consecrated, by the memory of a figure, solitary and smoking, crouched on some picturesque and inaccessible shelf, or moving with extraordinary lightness of foot along the screes . . . ". Sadly, Archer Thomson was the first of the great British rock climbers to take his own life. Aleister Crowley . . .
Black Magick . . .
Aleister Crowley (1875-1947) - "The Great Beast 666" - was a fine rock climber and credible boulderer, as well as a free-solo advocate. Here is the way he describes himself: "Owing doubtless to my early ill-health, I never developed physical strength; but I was very light, and possessed elasticity and balance to an extraordinary degree". Early experiences with inept guides turned him against any form of professional climbing, and he declared that the best amateurs were far superior to any guide. He was tutored in the basics of rock climbing by Norman Collie, the chemist who discovered neon and was the first to take medical X-rays. 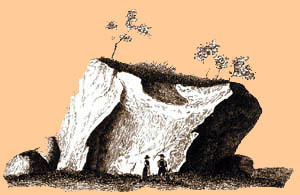 Collie was a major figure in early British climbing. To gain insight into bouldering in the late 1800s, here are two of Crowley's descriptions of separate incidents from that time period. 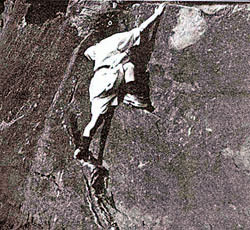 One involves his adversary Owen Glynne Jones - a dynamic climber who "leaped for handholds" and practiced short, difficult routes on a toprope before climbing them 'ethically' - the latter a procedure that was controversial and considered cheating by some, as climbers had begun debating the proper role of the rope as a protective device. Crowley, in addition, alludes to his own predilection for rope-less climbing. The Only Genuine Jones . . .
Owen Glynne Jones (1867-1899), an early gymnastic climber - some call the first athletic rock climber - is seen here on Derbyshire Gritstone. Probably the first real "tiger", he devised a difficulty rating system that evolved into the one used in Great Britain today. Jones, who began his short but intense climbing career in 1888, had a strong hand in establishing hard free-climbing as a proper end in itself, rather than merely as training for the Alps, although his tactics involving the use of the rope created some controversy. Nevertheless, it appears that he was climbing at the 5.7 and 5.8 levels, perhaps somewhat higher on boulders, in the mid 1890s. This should have put him at least on a par with free-climbing pioneers in the Elbsandstein area at that time, so that he could be considered one of the real forerunners of modern rock climbing. 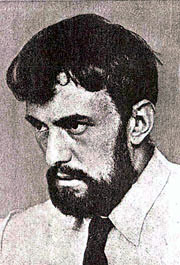 As a young man, he showed both mechanical and mathematical aptitude, and at one point was an assistant in a mathematics department. With a first-class Honours degree in experimental physics, and unable to obtain a professorship, he became physics master at the City of London School. "One Christmastime an ice axe was arranged as a horizontal bar . . . He [Jones] grasped the bar with three fingers of his left hand, lifted me with his right arm, and by sheer force of muscular strength raised his chin to the level of the bar three times." Historical Performances in Chin-ups, . . . In Climbing Days (1935), the author, Dorothy Pilley, speaks of Jones' rumored feats: ". . . Owen Glynne Jones, hero of innumerable unemulatable acrobatic feats.. . .That he could pull himself up on the top of a door ten times by the tips only of those slim fingers . . . I had known for years.. . But that he could make a standing jump in climbing boots from one platform to another across a single line of rails was a new and wonderful item of information." Jones was fondly referred to by his many friends as The Gymnast. One incident in his short but splendid climbing career is rather bizarre: To treat himself for a case of frostbite, he plunged his hand into a vat of boiling glue. The result was a hand deformed into a kind of permanent claw, which he cheerfully rationalized as being of benefit for climbing! Owen Glynne Jones died on Dent Blanche in an accident in which he and a fellow climber were holding steady an ice-axethat was jammed horizontally in a crack and being used as a boost for a guide to reach a hand hold. The guide couldn't retain his purchase and fell on Jones and his friend, and all three plummeted down the mountainside, pulling with them a fourth member of the party who had been stationed about 30 feet away. All, including a fifth climber, were roped together, and the last man desperately hugged the rock, waiting for the inevitable jerk - it never came, as the rope between him and the others had apparently been secured and snapped cleanly in two. This fifth climber, a gentleman named Hill, could not descend the route by himself, so managed to go a slightly different way and reached the summit, then down, collapsing in exhaustion and delirium from time to time. The day before he was killed, as he and W. M. Crook walked down the Arolla Valley, he told his companion, who had expressed surprise at the vast amount of climbing Jones was doing each week, "You see, there are only a few years in which I can do this sort of thing, and I want to get as much into them as possible." Getting Started Young . . . Here's a young boulderer, with her shiny new boots. From the Journal of The Fell & Rock Climbing Club (1913). One can only speculate about her destiny - now in the distant past.